Auto vinyl wrap is a great service that we offer at Superior Auto Image. Vinyl wrap gives car owners the ability to customize their cars as they desire, but is also easy for us to remove and replace if you ever want to change it. It has a variety of uses, from business advertising to simply giving your car a neat, unique appearance. You can also use it to cover up damaged parts of your vehicle. Wraps can be applied to most smooth surfaces, which means we can also wrap and customize the inside of your car! The 3M vinyl wrap that we offer is high-quality, durable, and stretchable. 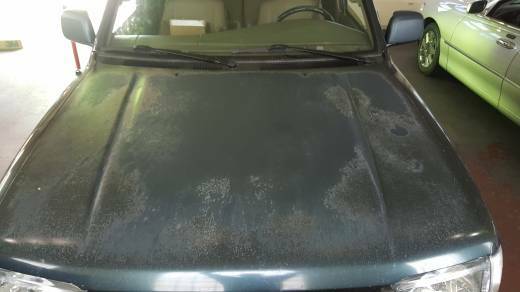 It will stick with your car for a long time, and its flexibility allows us to apply it to a variety of smooth surfaces. Like the clear bra, it is applied like a big sticker. One of the great features of vinyl wrap is that, while it is durable, it is also easy for us to remove from your car. Thus, it is easy for us to replace if it ever gets damaged or if you want a new look. We can also, in some cases, remove, heat, and reapply the wrap to adjust it if necessary. The 3M vinyl wrap is versatile and can enhance different parts of your car. We offer carbon fiber hood wrap, if you just want to customize your hood. We can also selectively wrap your wheels, or wrap your grill to give it a special look while also protecting it from minor scratches and bugs. We can even pattern your vehicle; for example, we can add your wrap in stripes, or apply it just to the bra of your car! And if you have a bike, we can wrap that, too! It comes in different colors: for example, you can get black vinyl wrap, chrome vinyl wrap, gloss black vinyl wrap, matte black vinyl wrap, and many other colors. If it exists, we can get it and apply it for you. You can also get clear/transparent wrap. Due to the stretchable quality of the vinyl wrap, we can cover virtually any smooth surface. This means that we can wrap the inside of your car, too! The 3M vinyl wrap is durable and can protect your car’s paint from minor damage, but does not offer as much protection as a clear bra, which is another service that we offer. Genuine carbon fiber wraps are very expensive. 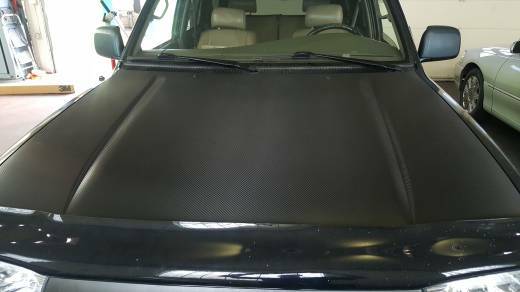 Carbon fiber vinyl wrap is a vinyl car wrap that looks just like real carbon fiber, but much less expensive. It is stretchable, so can be applied to a variety of smooth surfaces, not just the exterior. It’s also durable, offering some protection for your car. Many people like the black carbon vinyl fiber because of its shiny, sleek, three-dimensional appearance. However, there are many other colors available; come by our shop to pick out the one that’s best for you! Contact us at 303‑669‑1139 if you want to give your car, van, or bike a powerful, fast look for a lot less money! Customize your car with a special new color or pattern and make it stand out from the rest! Does not affect resale because our technicians can easily remove the car vinyl film if necessary. Give some protection to your paint job in harsh weather conditions, or against scratches and other damage. Many color options of available for you to pick from! Selectively custom wrap your hood, wheels, grill, or other parts of your car. Both the interior and exterior are wrappable. Graphics and advertising are also options; great for business fleets! Get Your Wrap at Superior Auto Image! To achieve professional, high-quality wrap on your vehicle, you want to make sure that only the most highly trained technicians are working on your car. Superior Auto Image has top-notch experts with the latest tools and technology needed to take care of your vehicle. They have years of experience, and you can rely on them to give you a flawless, precise wrap. We take great care of the cars that we handle. We expertly cut the wrap to fit your vehicle or any specific part of your car that you want wrapped. We have a sample book at our shop for you to look at to help you make color choices. It contains examples of the film colors that are available. We can get and apply just about any color they make. We are a local Colorado company and strive to make all of our clients happy with our results. Contact us today at 303‑669‑1139 to set up an appointment, or come by our shop and take a look at the color options. We are excited to help you customize your car the way you want it. We proudly provide either 3M or Avery Vinyl wrapping in Denver and we would be delighted to help you customize your vehicle the way you want it. Stop by our shop to look at all the beautiful colors you can get for your car or bike. Also, check out the other services that we offer, including car detailing, clear bra, and repairs! Schedule Your Vinyl Wrap Appointment Today!